A child murderer, whose crimes are carefully planned and deliberately executed, terrorizes Berlin for more than half a year. After the killer claims another victim, police are under intense pressure to finally catch him, but their increased efforts get them no closer to an arrest, and the city’s passions are stoked. Made as film was transitioning from silence to talkies, M bears the mark of its noiseless predecessors. It has a silent movie’s exaggerated performances, chapter transitions and contemplative pacing. Even more obviously, the audio sometimes cuts out, leaving us to view disturbing images without accompanying sound. Whether or not it is deliberate audio design, it helps establish a discomforting and uneasy tone, one that permeates the entire picture. 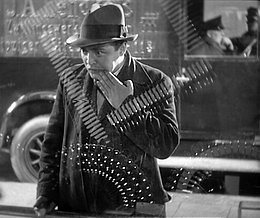 Writer/Director Fritz Lang makes us feel Berlin’s panic and grief at the mysterious deaths of beloved children, deaths no one seems able to prevent or undo. 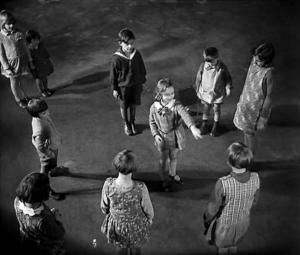 From the opening, where children sing a disturbing nursery rhyme, through the next few minutes when a child, Elsie Beckmann (Inge Landgut), stops to read a poster detailing the central mystery, through nearly all of M’s first half, Lang’s emotional acuity is impressive. His early choices contribute to making the audience so psychologically uncomfortable that we long for vengeance, just like the killer’s victims. That is when M becomes worthy of its status as a Classic. Just as our anger is most stoked, just when we most want someone to capture the killer, Lang slowly deconstructs the city’s reaction, as well as our own. By depicting mob mentality and badly placed police attention, Lang unflinchingly shows the mistakes otherwise good people can make during times of extreme stress. In fact, the director eventually makes us sympathize with the murderer and question the victims, a one hundred eighty degree transition that could be some of the best psychological filmmaking ever. Franz Lang deserves much of the credit, but not all of it. 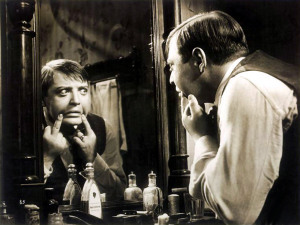 The rest goes to actor Peter Lorre, who plays the killer, Hans Beckert, with such careful scene-chewing exaggeration that we understand the man’s psychosis, fear and mental instability. It is a powerhouse performance that captures Lang’s intent and hammers home the picture’s themes. Themes just as relevant today as they were in 1931. What is the difference between justice and vengeance? How should we treat or punish criminals with mental illnesses? What are the best ways to ensure children are safe but also free to form their own identities? And more. Modern society hasn’t answered these questions any more effectively than depression-era society had, which means M remains a powerful artistic achievement, even eighty-plus years after its creation. In other words, M is superlative. But it is not quite perfect. In focusing so much on societal reaction to Beckert’s crimes, the film introduces countless characters, many of which blend together. Moreover, given that Beckert has eluded investigation for the better part of a year, the people looking for him might identify him a touch too easily. That said, the flaws are incredibly minor. This is a dynamic film, and one I cannot recommend more strenuously. Nice review. I agree it’s a phenomenal thriller and it’s my second favorite film by Lang. He can direct suspense as well as Hitchcock. If M is any indication, he sure can. This is the only Lang I’ve seen, though. What’s your favorite? Metropolis would be my favorite. The visual effects are still impressive today in my opinion. I think you’d enjoy it, actually. So you should see it. Wow. This seems intense. May have to hunt the DVD down. Nice review. It is intense. And fantastic. I don’t know your tastes well enough to say whether or not you’ll like it, but I’d be interested in hearing your thoughts once you’ve seen it. Love this film. Glad you enjoyed it too. Exceptional review! I remember first watching this film at NYU and boy was I stunned by how ahead of it’s time it was. My fav Lang film above his others. Nice job and I’m glad that you went into the psychological aspects of the material. That thematic element has always been a favorite of mine much like The Cabinet of Dr Caligari. Thanks for the review! This is my first exposure to Lang, but his other work is now on my list. Wow, serial killer films were being made back than? Cannot believe this was the first one. Just crazy reading that for me, as I love the genre. Despite never watching a film this old, I kind of feel like I am going to have to try it. If I can somehow find access to it that is…..
…May be a tad hard to track down! It used to be streamed on Netflix, I’m told, so other online outlets might still have it. I had that same service send me the DVD, but I’m sure you could rent it from iTunes or Amazon, as well. Lang is an iconic director and this is one of his seminal achievements, so I suspect you could find it fairly easily. And yeah. I think it was the first one. Might be the best as well. I definitely recommend you check it out. I can’t imagine M being a very difficult film to track down, as it’s quite popular in cinematic circles. You can even see the whole thing on YouTube for free. I have the Criterion Collection Blu-ray, which is a tremendous package for this tremendous film. Also, there were many serial killer pictures. 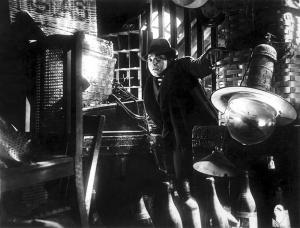 I believe Hitchcock’s The Lodger was one of the first (that was in 1926 or 1927, depending on who you ask) to feature a serial killer, but M was one of the first to put more of the focus on the killer. I found it on Youtube! Thanks for the heads up, and I think I may be watching it in the next few days. I think I misunderstood the opening sentence when it says, “M, the first serial killer movie”, but yeah, I would not know as my knowledge of older films is quite awful. As a film lover, I am embarrassed to even admit that. And thanks for the historical background. I read online that this was the first serial killer, but didn’t know the conditions under which the claim was made. It’s probably a technicality. I think M was one of the first films to heavily concern a serial killer, whatever that means, while The Lodger was one of the first to feature a serial killer. My hunch is that it goes back further than Hitchcock, though. This is one of my favourite films of all-time. It’s one of the best depictions of the darkness of the human soul ever committed to celluloid and Lang is a genius. Agreed on all points. It really is fantastic. A brilliant film – great to see you highlighting it (and writing so passionately about why it is so good). I hope more people are encouraged to give this one a try. Me too. It stands the test of time very well.